According to the Portsmouth tax collector's office, Lonza Biologics Inc owns the most valuable property in Portsmouth, NH. The 18 acre property, located at the Pease International Tradeport at 101 International Drive, is assessed at over $110 million dollars. Lonza's a 2008 property tax bill came in at just under $1.9 million. Photo courtesy of Lonza Group Ltd.
Lonza Group Ltd, which owns Lonza Biologics Inc. in Portsmouth, is a Swiss company headquartered in Basel. The Lonza Biologics website describes the Portsmouth facility as a production site that "specializes in the large scale custom manufacture of recombinant therapeutic proteins and monoclonal antibodies by mammalian cell culture." So in addition to having the largest tax bill in the city of Portsmouth, Lonza is an important employer in the region and is a major contributor to the NH Seacoast's economic vitality. Since arriving in Portsmouth in 1999, the Lonza facility has been expanded multiple times. But just what does Lonza manufacture in Portsmouth? I'm not sure about you, but when I think about a big manufacturing plant, the first things that come to mind are cars, refrigerators, and big-screen TVs. I might even imagine chemical products like household cleaners and personal care items. I definitely would not think of "Recombinant therapeutic proteins and monoclonal antibodies made by mammalian cell culture." What does that mean anyway? What follows is a layperson's attempt to parse and understand what Lonza does in Portsmouth. The biotech industry is very competitive and therefore rather secretive, so precise information is tough to track down and verify. If anyone knows better or if I've gotten something wrong, please correct me in the comments. In Portsmouth, Lonza does something called "contract manufacturing," which means that they manufacture products on behalf of other companies which generally own the designs and rights to the products. Many industries use contract manufacturers because the expertise needed for product design and development is very different from what's needed to be an efficient and high quality manufacturer. 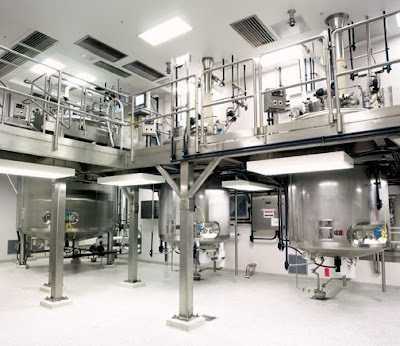 In medical manufacturing, there's also a complex maze of safety and regulatory requirements that a manufacturer must navigate. These headaches can all be handled by hiring a reliable contract manufacturer. 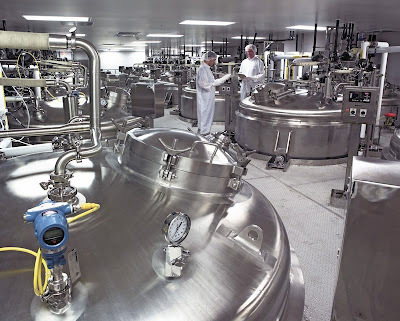 So in short, Lonza enters into agreements with pharmaceutical companies, such as Genentech, Amgen, Bristol-Myers Squibb, or Eli Lilly to manufacture products or parts of products to exacting specifications on their behalf. The pharmaceutical companies get reliably manufactured products, and Lonza makes a good living while employing lots of folks in Portsmouth. 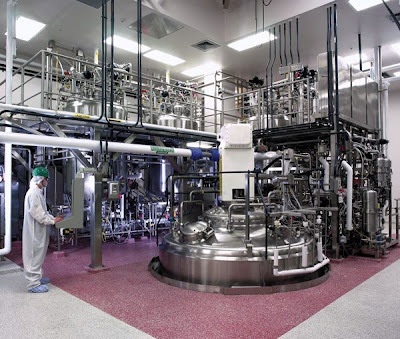 Generally, Portsmouth's Lonza plant doesn't make actual medicines prescribed by doctors, instead it makes important ingredients that are used in the medicines. No doubt, the Portsmouth facility is a high-tech wonder. 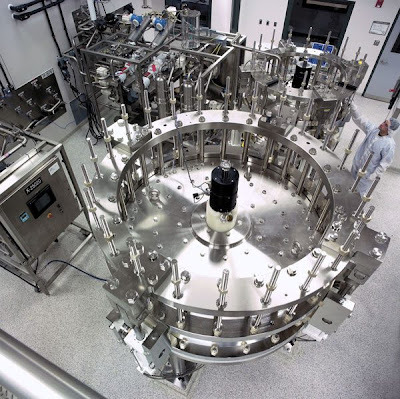 Creating the processes to reliably and safely mass produce pharmaceutical companies' inventions seems like no small task, especially when you consider that many of the substances they're making are actually alive.